Modular Wall System Information and Pricing | Panel Systems Manufacturing, Inc. Please contact us for a specific quote and additional sizes for your modular wall system. View modular wall installation information. Click here to view a list of our fabric color choices. Read more about our FP modular wall series. The FP-series modular wall is designed for use as a semi-permanent wall system that can easily be installed by anyone with basic carpenter skills. When the time comes it can just as easily be taken down and used over and over again. Unless you specify otherwise, the usual installation for these room dividers is made up of standard 50” wide panels fastened end to end using aluminum channels that draw the panels together into a solid wall. 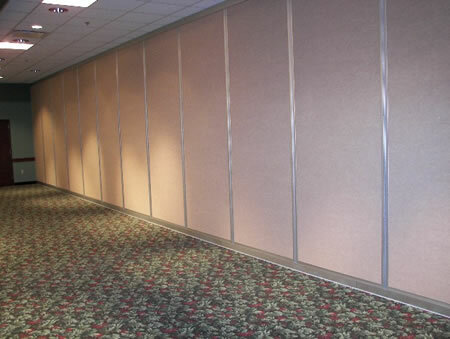 A custom sized panel is inserted if need be to bring the overall wall width to your length specifications. Our Modular wall is offered in three models. The FP-1000 with acoustical fabric faces laminated to two back to back sheets of 3/8” gypsum board. The FP-1200 with FRP Structoglas faces laminated to a core of 1” thick ridged fiberglass board. The FP-1200 produces room dividers that are light weight, easy to clean and ideal for factory and clean room construction. The FP-1500 with acoustical fabric facing is laminated to two 24 gauge sheets of galvanized steel. Between the steel sheets is a core of honeycomb material. This makes the FP-1500 room divider very ridged, lighter in weight and better at reducing sound transfer. We do not provide ceilings and suggest using suspended ceilings if a ceiling is required. Please contact us @ 800 257-1190 for a specific quote and additional sizes for your modular wall system. Copyright © 2019 Panel Systems Manufacturing, Inc. . All rights reserved.